While there are some basic ingredients in the best shrimp scampi recipes, it's the little changes that make the recipes unique. 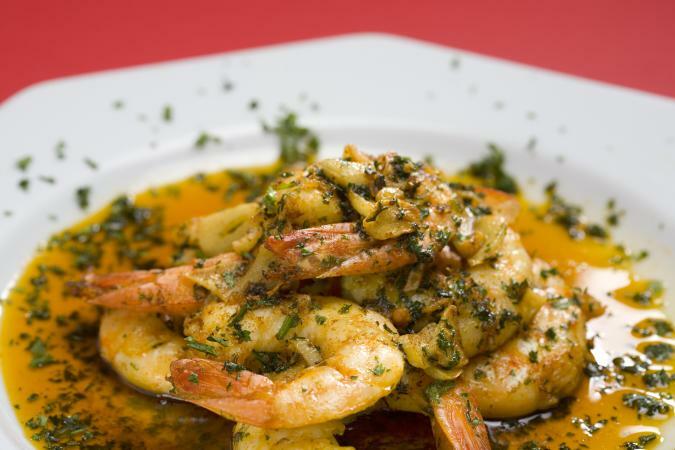 Cooking shrimp takes a watchful eye, and sometimes preparing sauces and accompaniments can take quite a bit of time and effort. The biggest tip is to buy your shrimp already de-tailed and de-veined. That will save you time to concentrate on the scampi sauce. Celebrity chef Emeril Lagasse's recipe for shrimp scampi has a bit of kick, as he seasons the shrimp with his signature blend of Creole seasonings prior to cooking using traditional scampi ingredients (butter, lemon, white wine, and garlic). His recipe also calls for some unusual add-ins, such as crushed capers and red peppers. Celebrity chef Wolfgang Puck's shrimp scampi recipe has a bit of an Italian twist. Ingredients that make it unique include Italian parsley and shallots. He also adds in a bit of flour for a somewhat thicker sauce. He recommends serving the dish over brown or white rice. Martha Stewart's shrimp scampi recipe takes classic ingredients to the next level by including fresh tarragon and grated onions. This recipe requires cooking the sauce on the stove, letting the uncooked shrimp marinate in the prepared sauce for half an hour, then pouring it over the shrimp for final cooking in the oven. Food Network star, Tyler Florence (of Food 911), has a great recipe for shrimp scampi with linguini. Prepare the pasta first, then cook shrimp using his tasty scampi recipe (with traditional ingredients plus shallots and red pepper flakes). When the shrimp are cooked, remove and add more liquid and butter to the pan to make more sauce, then stir in the pasta and shrimp. Successful actor turned cookbook author Freddie Prinze, Jr. has an interesting shrimp scampi recipe incorporates breadcrumbs and an egg into the usual ingredients. He also adds rosemary as well as parsley and shallots. This dish does not require any stovetop preparation - it is cooked entirely in the oven. If you're looking for a low carb way to enjoy scrimp scampi beyond eating just the shrimp on their own, you're sure to love this recipe for Shrimp Scampi with Zucchini Noodles shared on the Muscle & Fitness website. What makes it great is that it's designed to provide a "satisfying low-carb meals" since it's intended for serving with spiralized zucchini. It's a fairly basic scampi recipe, though it doesn't include any wine. Rachael Ray's Chinese-Style Shrimp Scampi is nothing like traditional recipes, but it is super-tasty! It contains shrimp and garlic, but those are the only usual scampi ingredients to use for this dish. You'll use safflower and sesame oil and sherry, as well as Sriracha, soy sauce, sesame seeds, ginger, and other flavoring agents commonly used in Chinese cuisine. You may have seen this dish prepared on television, as Chef Kristiahna Clark tested it on Celebrity Test Kitchen. As you would guess by the title, this recipe for shrimp scampi from Tia Mowry includes cherry tomatoes. It is also made with heavy cream and its seasonings include paprika, chives, and parsley along with classic scampi ingredients. It's intended to be served with pasta. If you're a fan of Instant Pot recipes and you love shrimp scampi, you have to try out cookbook author Mark Bittman's Instant Pot shrimp scampi recipe. Using basic shrimp scampi ingredients, what's unique about this recipe is the fact that it's prepared quickly and easily using an Instant Pot. Once you've mastered the technique (which is quite simple), you can add other ingredients if you want!